In this video, Princess Genevieve and I talk a little about our new favorite author, David Bentley Hart, and recommend a couple of his books. Once again, I couldn’t recommend more the writings, especially these two books, of this great modern Orthodox theologian. For more of my YouTube videos, click here. A couple of weeks ago I posted here about the lack of intellectual honesty in the various objections to Christ and his Church. I stated in that post that I’ve never seen an intellectually honest objection to either. 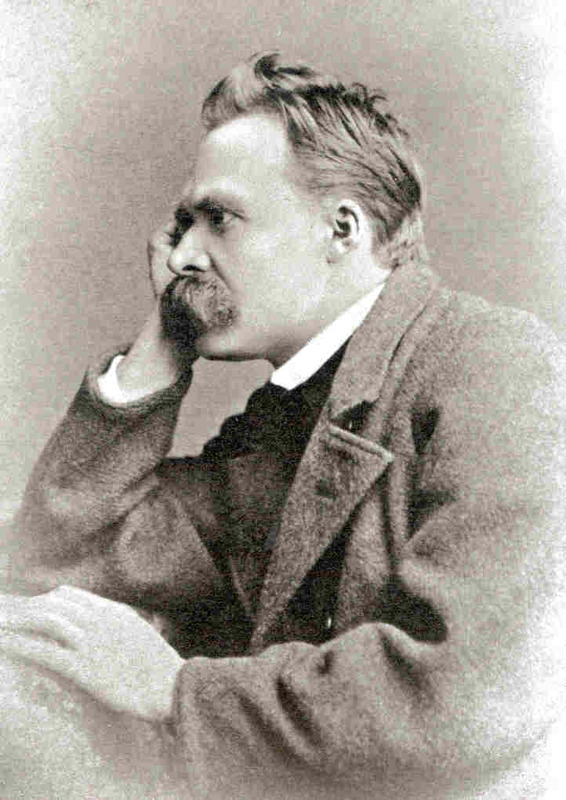 I was mistaken and I take that back; I’ve seen one: that of the German philosopher Friedrich Nietzsche. Nietzsche not only produced the only honest objection to Christianity I’ve ever heard, but is also the only honest atheist I’ve ever “met.” He knew what Christianity was/is: a “revaluation of all values.” He was not too stupid and/or ashamed (as all modern atheists are) to admit the fact of the matter: that Christianity is a religion of love (of God and others) and peace, a complete reversal of pre-Christian pagan life and thought. Importantly, he also saw that same pre-Christian paganism for what it was: brutal and selfish. He found no need to invent lies about Christ’s personal sanctity or to vastly exaggerate the quality and quantity of the Crusades and Inquisition. Indeed, such objections would have been objectionable to him. He saw it and said it like it was. He, though, chose the brutal, selfish paganism of pre-Christian times over the gentleness of Christianity. Clearly, I disagree with his choice here, but I respect him for making it honestly. Modern atheists could learn much from Nietzsche, and, for that matter, so could Christians. [Socrates:] Thus then we seem to have discovered that the many ideas which the multitude entertain about the beautiful and about all other things are tossing about in some region which is halfway between pure being and pure not-being? Then those who see the many beautiful, and who yet neither see absolute beauty, nor can follow any guide who points the way thither; who see the many just, and not absolute justice, and the like, — such persons may be said to have opinion but not knowledge? The one loves and embraces the subjects of knowledge, the other those of opinion? The latter are the same, as I dare say will remember, who listened to sweet sounds and gazed upon fair colours, but would not tolerate the existence of absolute beauty. There was a thought that struck me as I did the research for my post on the First Ecumenical Council and another that I’m working on about the historicity of Christ. I think that there is a fundamental misunderstanding ingrained in the Western (and especially American) mindset, namely, that if all opinions are allowed then all opinions must naturally be equal. We have a very “do-it-yourself,” anti-authority attitude; take, for instance, the popularity of “home remedies” accompanied with the general distrust of conventional medicine. Nobody is willing to “leave it to the experts” anymore. Sometimes we’re not even willing to admit that they are experts! Relativism has invaded every aspect of Western culture, from religion to science to morality. American schools propound relativism as if it itself were the absolute truth! Take, for instance, this popular high school sociology textbook: “We must recognize that judgments about good and bad, moral and immoral, depend very much on who is doing the judging; there is no universal standard to appeal to.” That‘s what my tax dollars are paying for our children to be taught? The reason I bring up this topic is because of my surprise at how easy it was to find scholarly information online that very clearly rebutted nearly every sentence in Zeitgeist, the Movie. And yet, somehow, it is still immensely popular. How do the fans and the maker of Zeitgeist respond to this? By claiming that the scholars can’t be trusted. But a “self-taught” “Egyptologist” with a penchant for the occult and a plagiarizing pseudo-mystic can [both cited multiple times as references by the movie’s creator]? While the ideals that we inherit from the Enlightenment may allow for all ideas and opinions to be equally expressed, this does not mean that we need to give them all equal air time or credence. It also does not mean that one can logically hold an opinion contrary to fact. I cannot be of the opinion that the sky is magenta when it is very clearly blue. Sometimes opinions are wrong and facts are right. Sometimes there really is an absolute truth and to hold an opinion contrary to it is not an exercise of freedom, it is an exercise in foolishness. I am trying here to prevent anyone saying the really foolish thing that people often say about Him: ‘I’m ready to accept Jesus as a great moral teacher, but I don’t accept His claim to be God.’ That is the one thing we must not say. A man who was merely a man and said the sort of things Jesus said would not be a great moral teacher. He would either be a lunatic — on the level with the man who says he is a poached egg — or else he would be the Devil of Hell. You must make your choice. Either this man was, and is, the Son of God: or else a madman or something worse. You can shut Him up for a fool, you can spit at Him and kill Him as a demon; or you can fall at His feet and call Him Lord and God. But let us not come with any patronizing nonsense about His being a great human teacher. He has not left that open to us. He did not intend to.